The sixth is another narrow and long par 5. Off the Tee water guards the right side of the hole with bunkers and OB down the left. 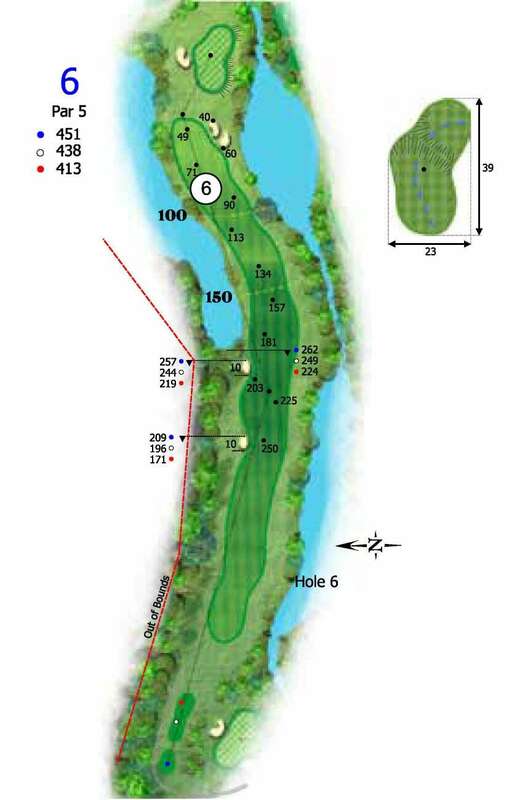 Once in play the second shot is equally dangerous with large lakes and a creek framing both sides into the green. If you negotiate the first two shots safely you will have a short iron in to a deep undulating green protected by bunkers front and left as well as gullies and water close on the right. Safe Play: Lay up short of the fairway bunkers on the left, from here you can lay up to the largest part of the fairway leaving you with a short iron into this large green. Aggressive Play: Hit driver just right of the second fairway bunker, go for the green with your second shot, anywhere on or around this large green should make for an easy birdie.